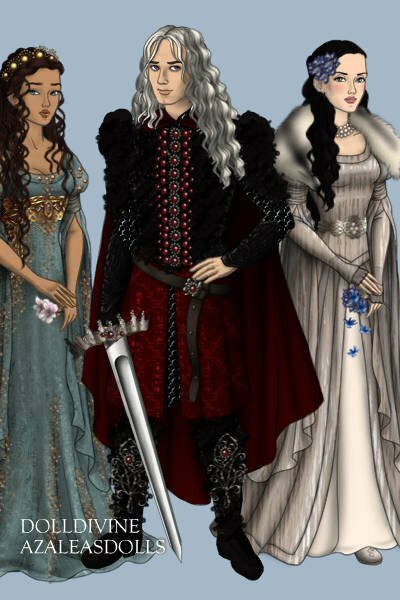 Crown prince Rhaegar was married to princess Elia Martell, but some say he secretly loved lady Lyanna Stark. Horselover1289: I totally fell for Rhaegar the moment I red about him. There's just something about Targaryens. And I wanted him to look good too, not just the women :) And thank you very much! You know, I normally don't go for pretty boys, but this version of Rhaegar might just convert me. On a more serious note, the care you took in making this doll really shows, as the attention paid to jewelry, boots, etc. really make it. Thanks for your nice comments! :) And thank you to all voters! <3 Serrelinda: I hope to see that too! I love the dress of the one on the far left! Very pretty and intricate!